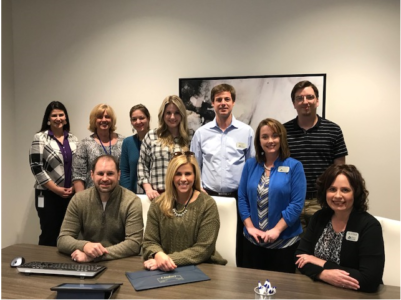 Springdale, AR – On December 18, 2017, WACO Title Company (“WACO”) made history by becoming the first title company in Arkansas to complete an electronic notary closing in its new headquarters building in Springdale. The closing was conducted by Emma Bridwell, and the process was coordinated and driven by Amanda Brumbelow, WACO’s Director of Closing Operations, with assistance from the WACO operations team. The e-notary technology was made possible earlier this year through Arkansas’ adoption of Act 306, officially known as the Arkansas Electronic Notary Public Act. Soon after, the Arkansas Secretary of State began the process of commissioning e-notaries, and WACO quickly jumped on board by having 30 of its associates, including Bridwell and Brumbelow, receive their e-notary credentials. 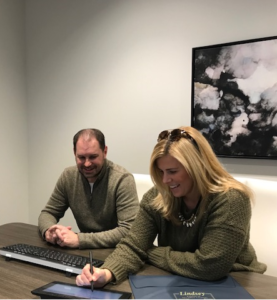 Matt and Jamie Romine of Fayetteville were the participants on the customer side, and Pavaso, Inc. provided the digital platform through which the e-closing was conducted. The closing took roughly five minutes to complete, a significant time savings over the traditional wet-ink closing process. documents at WACO Title’s Headquarters. The Romines and members of WACO’s team gather to commemorate the ground-breaking e-closing event.